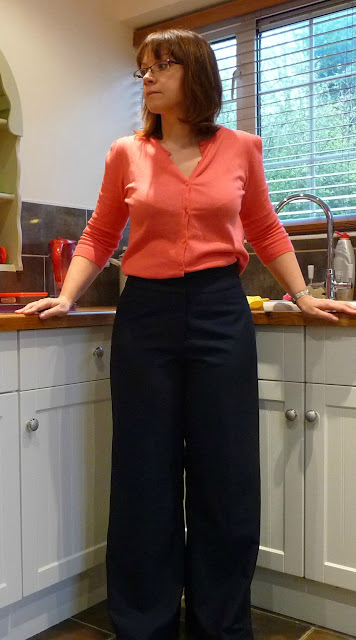 I Have Made Trousers And They Fit! At the beginning of the year, like many others, I signed up to Karen at Did You Make That's Sewultions. We all made our pledges stating what we wanted to achieve sewing-wise this year - our sewing resolutions. Mine was to make a pair of trousers that fit me properly. And by jove, I think I've done it! I've been humm-ing and ha-ing for ages about which trousers to make. I'd even bought a pattern for a slim legged pair (McCalls 6707), but I wasn't sure about them. Then on impulse last week I bought Simplicity 2562 - one of their Amazing Fit patterns. This is completely the opposite of the McCalls pattern I was originally going to make, the legs are VERY wide. But let me tell you, it is aptly named! The fit is simply amazing! I opted to make them without pockets or turn-ups (basically because I didn't have enough fabric), and based on my measurements decided I needed to use the pattern pieces for the curvy fit. And do you know what, they fit almost perfectly , with no alterations at all! I haven't finished the hems yet, they're just tacked up waiting hubby's confirmation that I've got them the right length. I will try and get a couple of better pictures once they are completely finished. I can't believe how straightforward these were. Even the fly front (which I've never made before) worked perfectly. It really was a case of "follow the instructions and hope for the best". As I don't have an overlocker, I finished all the exposed edges with bias tape. The fly and crotch seam in navy, and the legs in pink, because the shop didn't have any more navy. My husband commented last night that they look "very professional". When I make these again (and I definitely will) I'll make a few changes, but only small ones. They are very high waisted, which I don't mind, but I'd probably take about 1/2 an inch off the top of the "body" part before adding the waistband. I'd also make the legs slightly narrower because they are very wide. I'm thinking of a red pair - would that be too much?! Oooh, on another note - I've signed up to Me Made May! It will be my first time participating, and I'm very excited. As this is my first go, I wasn't sure that I could commit to wearing me made clothes every day, so I've pledged to wear me made items at least 3 times a week. I am hoping I can do better than this though! No, a red pair would not be too much! I think you have done a lovely job, and I think I will investigate these pants as I have fit challenges too. I love the pink binding inside. Thank you. The pattern worked really well for me, it might help you if you have problems with fitting. Thank you Rosy. I'm so pleased with the fit, I think they fit better than any of my ready to wear trousers. You should do MMM, I think it will be fun! Well done Sam" what an achievement. You've nailed trousers!!! And fly front!! I like the bias finished edges too, as your hubby said, very professional and I think long lasting too!! Enjoy MMM, it's fun!! Ha ha! Thank you! I've nailed THESE trousers anyway. I might have to always use this pattern if I want trousers from now on. I'm really looking forward to MMM. Wow, these look fantastic! Hmmmm . . . I bought a few of these Amazing Fit patterns but haven't tried any of them yet. Perhaps it's time! Your hubby was right - they really do look very professional! Thanks Gail. I'm so pleased with how they've turned out. I bought an Amazing Fit pattern for a dress (can't remember which one at the moment!) at the same time, and I'm keen to try that as well now. Love your pants and by all means .. you need to do a red pair.. that will be beautiful. I bought this pattern, but hadn't tried it.. You have encouraged me to try it. thank you. Aw thank you! Yes, I'm almost certainly going to do a red pair, I have some fabric in my stash I can use. I think a red pair will be made! My wardrobe seems to be turning quite nautical looking this spring. Based on the success of this one, I would definitely try more of the Amazing Fit patterns. Congrats on your sewlution! A red pair would be perfect! I just found you through Karen's Sewlutions. You and I have the same trouser pattern! I'm looking forward to seeing how you narrow your legs as I've got to try that too. It is a great fitting pattern!